Dempson Ltd is a leading UK based manufacturer of paper bags and carriers, sheeted paper wrapping products, serviettes and paper rolls. They supply packaging material to the Media Industry and have extensive contracts with the BBC and school organisations. Established in 1948, Dempson have been passionate about paper since their early days. Today the Dempson group of companies has grown to become one of the largest and most dynamic bag manufacturers in the UK, with one of the widest and most varied product ranges in the industry. In February 2014 Dempson experienced considerable business disruption due to a warehouse fire at their Bradford premises in Yorkshire. The fire resulted in considerable stock being lost and premises being unfit for occupation. Dempson began an extensive search to find new premises to replace the ruined warehouse as a matter of priority. They successfully acquired a new warehouse, still in Bradford, in May 2014. The warehouse needed to be fitted out to enable it to be fit for purpose. 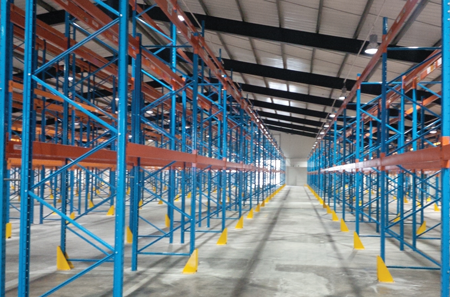 Dempson contacted Acorn Warehouse Solutions (AWS) to design a bespoke racking system for the storage of their merchandise in the new warehouse. Following a survey of the warehouse, AWS presented various options for its use. Dempson opted for maximising the overall cube of the building by using pallet storage 1000 mm face x 1200 mm deep which also gave the advantage of storing Euro pallets. Conscious of the fire damage to their previous warehouse, Dempson were keen to minimise the risk of fire by avoiding the use of slatted timber decking. With the designs approved and materials selected, AWS set about installing the chosen solution. The style of pallets used for this fit out was something that Dempson had not used before and they welcomed the flexibility the system gave them without the necessity of putting any slatted wooden decking or other pallet support medium on the racking. The other advantage that Dempson gained from the solution was the increase in pallet capacity over the style of racking previously used. It enabled the storage of some 3,000 pallet locations where previously they were only able to store around 2,000 pallet locations. Dempson wanted ensure the solution was cost effective and as such AWS looked at ways to reduce the cost of the fit out. They were able to provide high quality used racking at 14-days’ notice to the new warehouse which did reduce the overall cost of the project. The racking system was installed – with barrier protectors and end protectors to minimise fork lift truck damage in the future – over a period of two-weeks. Dempson were able to move in to their new warehouse in a tight timeframe minimising disruption to business continuity. “I was completely satisfied with the way the project was delivered on time and at good value for money. The AWS team had good attention to detail and excellent management of the project. We are really pleased with the finished result and are proud to show our new warehouse to our clients.”.